the best first aid advice ever! 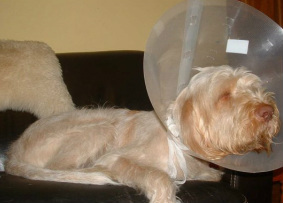 Ring your vet when your dog is injured or showing signs of unwellness. It is faster and far more reliable than looking things up on Google or asking for advice in forums (with grateful thanks to Megan Jones). The site is still a work in progress, I hope to have it fully written and published soon. If you wish to send some feedback you may use the contact form or email me at: jackie.murfin67@gmail.com. If you read nothing else on this site, be sure to read the section on Bloat. This is a killer that can be prevented by prompt treatment, every dog owner should know the signs and symptoms. Re-read them and memorise, it could save your dog's life. If you are taking your dog on holiday, remember to look up the nearest vet and save the number to your mobile phone. Program the address into your SatNav if you have one, or make a note of how to get there. * The advice given here in no way constitutes an alternative to proper and thorough veterinary investigation and treatment. ** Where applicable I have included alternative treatments such as homeopathy. Since these are not to everybody's taste, I have marked them in italics. This is not a forum for debating the pros and cons of alternative remedies as plenty of those exist already. I have included them here for completeness and to serve a growing number of dog owners who prefer not to medicate if they can help it. *** Where links are provided to products, they are to demonstrate the product only. If you are purchasing please shop around for the best value.